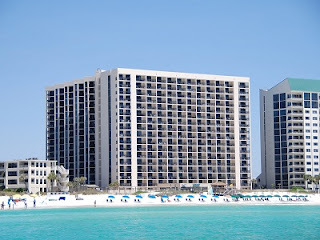 Destin FL beachfront vacation rental at Sundestin Condos. This Florida resort home is a beautifully decorated one bedroom, one and a half bath, that’s located directly on the beach with a gorgeous coastline view. This spacious unit offers a charming master bedroom with a king bed, Television, DVD player, and a sliding door leading to the balcony. The Living room has a large screen Television, DVD player, queen sofa sleeper and sliding doors leading to the balcony. Located on the 18th floor this unit offers coastal views of breathtaking sunsets, the sugary white sands and the sparkling emerald water of the Gulf of Mexico. The kitchen is fully equipped with everything to prepare your culinary delights. Destin Florida just east of the Fort Walton Beach, the semi-tropical Florida Panhandle weather makes the area a popular tourist destination. Approximately 50" of rain is received in the area each year, combined with the Gulf of Mexico, high humidity is the norm during the summer. Thunderstorms are a frequent occurrence in the summertime, but they are generally brief with sunshine quickly returning. Winter, by comparison, is delightfully much cooler and drier, making for ideal conditions for enjoying outdoor activities.